The nominations for the upcoming Grammy awards have been announced. For the first time in many years, there isn’t a contender in the Record, Song, or Album category that has any connection to country music. Couple that with the reduced number of country categories, and there isn’t too much to write about this year. Here’s a rundown of categories with country nominees, along with a list of who didn’t make the cut and some brief commentary. Adele Adkins & Paul Epworth will win. The Band Perry joins a long list of breakthrough country artists that have made the cut in years past, including winners LeAnn Rimes, Carrie Underwood, and Zac Brown Band. Not a bad year to combine the vocalist categories, as even the high-profile omissions aren’t particularly noteworthy. If past awards are any indication, this is a race between Swift and Underwood. A lot of Grammy staples didn’t make the cut, including several previous winners in the category. With only four nominees, it’s quite a coup that the Civil Wars slipped in there! Not too different from the CMA list. Here’s hoping that they recognize the Gill composition next year. Impressive breakthrough nominations for Aldean, Church, and Shelton. Even more so than usual, the American Roots categories provide a finer showcase of country music than the proper genre categories. Additionally, the Bear Family collection The Bristol Sessions, 1927-1928: The Big Bang of Country Music, earned two nominations: Best Historical Album and Best Album Notes. Re best country song, was Ronnie Dunn’s “Cost of Living” not eligible? I agree Kevin. There simply isn’t much to say about this list. In the end, I just don’t think it was a banner year for country music. I am happy that “You and Teqhila” is up for best song, and I think it will actually win. Otherwise, I’m so bored with the nominations this year. On the pop front, I am surprised and disappointed that Foster the People did not get nominated for Best New Artist. In the all-genre categories, I am totally Team Adele this year. Please let Best Country Album not go to Lady A. Own the Night was a bad album now matter how many copies it sold. Go with Church, Strait, or Swift. Kinda surprised Sierra Hull didn’t get a nomination for bluegrass album, especially with Alison Krauss seeming to promote her a fair amount. Blech. My first thought when I saw the nominations was, “What the eff?” But, after thinking about it, I guess there really isn’t much missing since there really isn’t much I liked this year. I’m mostly excited about Adele and I’m hoping Krauss wins for Bluegrass Album. As for the other races, I am super disappointed to not see “Colder Weather” in Duo/Group Performance category. I guess I’ll be pulling for “You & Tequila”, Strait and McBride (out of default in that category since it’s the one I dislike the least). Good call on Dunn, Bob. 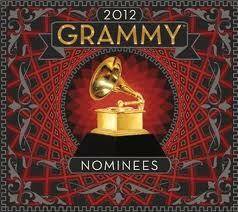 I think likely winners on Grammy night will be Swift, Civil Wars, maybe Aldean and maybe Steve Martin over Krauss. Yeah, I went to the actual nominations list that the voters chose from to pull the noteworthy omissions. There weren’t many. “Cost of Livin'” wasn’t submitted for Best Country Song or Best Solo Country Vocal Performance. “Bleed Red” was submitted in both categories. It sure would be nice to see The Civil Wars pick up an award or two. Thanks for checking. I guess I’m out of touch. I think “Cost of Living” is far better than “Bleed Red”. Based on who the voters did go for, I have a hard time imagining “Cost of Livin'” getting a nomination even if it had been submitted. An appropriately awful slate of nominees for a generally awful year for country music. The two performance categories have exactly one nominee apiece worth voting for, and the song and album categories have three solid nominees each. At least Aldean didn’t land the General Field nominations that most pundits were calling for, and The Incredible Machine was left out of Best Country Album. I don’t think band perry is the favorite right now to win BNA. I think it would go to Bon Iver. I don’t know why, but the obscure Grammy nominations always stick out more than the obvious ones to me. The Band Perry for Best New Artists. Sadly, they don’t seem to the favorite to win. How sad is it they could lose to freaking terrible “rapper” Nicki Manji? Kenny and Grace for “You And Tequila” This one should win in all of its respective categories, in my opinion. It’s just so good. Carrie Underwood for “Mama’s Song.” I know the lyrics are borderline cringeworthy, but this is one of Carrie’s most heartfelt vocal performances to-date, and she deserved a nod here. How ironic would it be if she won for this after she lost for “Just A Dream” to “White Horse? The irony. The Grammy’s must adore Underwood if they gave her a nomination after a non-existent year on radio and otherwise. She’s gotten at least one Grammy every year since “Jesus, Take The Wheel.” Pretty impressive. Blake Shelton for “Honey Bee” and “Red River Blue” I’m sorry, but what is going on here? “Honey Bee” is nowhere near Grammy-worthy, and the flood of premature nominations makes me cringe. Who actually thinks he has a shot at winning any of the awards he’s been up for this past year? I don’t even see the point in nominating him because anyone who follows country music knows he is not worthy of superstar status yet. Taylor Swift for “Mean” (Song of The Year) You have GOT to be kidding me. I can’t believe this immature (and horribly sung) song was nominated. Taylor Swift is only nominated for Grammy’s because of her popularity, which is pretty sad. “Colder Weather” snubbed? What the heck were the voters drinking when they voted? Seriously. They would’ve fallen all over a fantastic song like this a few years ago. I’m still shocked this was snubbed, it was one of the best songs released this year. Rascal Flatts snubbed for “I Won’t Let Go.” Of course it’s no secret no voting panel seems to like Rascal Flatts, but I was really disappointed this was left out of the running. Gary’s vocal performance is fantastic, and it really takes the song to another level. The lyrics aren’t the greatest, but if you can’t reward a vocal like that while giving a nod to the terrible “Mean,” I see no excuse for this omission. I just don’t get it. Why do voters dislike Rascal Flatts, but fall all over Swift and Antebellum? Speaking of Lady A, I was surprised they didn’t get a nod for “Just A Kiss” but even more disgusted that the horribly boring “Own The Night” snagged a nomination. Ugh. And, Aldean, oh Lord. How the heck was “Dirt Road Anthem” nominated for any Grammy’s? What a terrible choice, which is especially glaring when you see the omissions of artists like Keith & Brad. I was surprised by Martina’s nomination, but even more so when Sara didn’t sneak in with “A Little Bit Stronger.” Martina hasn’t had a nomination in years, yet she’s chosen to be nominated over for the biggest hit from a female this year? And the omissions of Keith and Brad were very surprising as well. I can’t remember the last time both of them were shut out at the Grammys. I’m really only interested in the American Roots category this year. I’m very intrigued by the nominations this year. Adele will sweep the night with Album, Record, and Song, as well as Pop Solo Vocal (for “Someone Like You”) and Pop Vocal Album (for “21”), but I’m curious to see who will win Best New Artist. Please note that, judging by Grammys past, the winner usually isn’t ever the biggest mainstream artist at the time (let’s not forget the outrageous selection of Esperanza Spalding over Justin Bieber, Florence + the Machine, Drake, and Mumford & Sons at the 53rd show, and Adele (who, at the time of her win, was a one-hit wonder ) beating the international sensations consisting of The Jonas Brothers, Duffy, Lady Antebellum, and Jazmine Sullivan, whom which were all considerably bigger than her at the time). With that being said, I don’t think Nicki Minaj will win. I’m thinking that The Band Perry will take it. They’re critically-acclaimed and commercially-successful enough to balance everything out to make them the standout. However, I wouldn’t be surprised if Bon Iver wins it, since he’s the only nomination of the 5 nominees for this year’s Best New Artist award to have received Song and Record of the Year nominations, as well (for “Holocene”). The Country categories are all pretty…strange to a certain tee. “Mean”, Taylor Swift – understandable considering Taylor’s popularity from the past year, but I don’t think it will win because it’s simply not a good song. However, I could be wrong, since the Grammys think it’s a song that’s so great that it should be nominated for Country Song of the Year (*gag* — will get to THAT one later on in this post). “Honey Bee”, Blake Shelton – the only reason this was nominated is because it was the biggest #1 of 2011 for Country music. I refuse to believe that it was nominated for anything else. It’s such a cheesefest of a song, and I don’t think this will be the Grammy Award that Blake could win. “Mama’s Song”, Carrie Underwood – A good song? No. A good vocal? Probably the best vocal of 2011 (even though it peaked early in January of the year), which is why I think this will be the front-runner of the entire category. Plus, Carrie’s a Grammy darling, and a much larger one than Taylor (regardless of the awards that Taylor has won in the past). Carrie has received, at minimum, one Grammy nomination EVERY YEAR since her debut of “Jesus, Take the Wheel” back in 2007, which won Country Song, Country Female Vocal Performance, and was nominated for Song of the Year. I don’t know of any other Country artists that have had that. “Dirt Road Anthem”, Jason Aldean – I don’t think he’ll be winning this one. It’s just a very boring song, regardless of the remix that might have helped with its popularity. “I’m Gonna Love You Through It”, Martina McBride – She hasn’t won a Grammy yet, and with the song’s lack of notoriety, I don’t think this one will do it for her, either. It’s a pretty song and a pretty vocal, but it doesn’t have the public and commercial success to grab the attention of the Grammy voters like Taylor and Carrie will be able to. “Mean”, Taylor Swift – Childish, bane, incessant, harshly-vocalized, and yet it will most likely win because it’s by Taylor Swift. “Just Fishin'”, Trace Adkins – Pretty random if you ask me. I’m sure Trace must be thrilled with this nomination, and I hope he keeps his enthrallment to a minimum because it will probably just stay as it is come showtime in February: a nomination. “Are You Gonna Kiss Me Or Not?”, Thompson Square – This is a very exciting thing for such a new duo. It’s become the biggest song of 2011 for Country music (unless “Don’t You Wanna Stay” has taken over that title — correct me if I’m wrong, please), but I don’t think that it will be the winner. For such a new duo, I think they’ll have to take a seat and accept this nomination as it is, and clap for Taylor when she wins. “God Gave Me You”, Blake Shelton – I think that Warner Bros. got their submissions wrong. “Honey Bee” should’ve been inputted for this category, and “God Gave Me You” should’ve been inputted for Solo Country Vocal Performance. If that were to have happened, then I think he would have a great chance at winning BOTH categories. With the mix-up, I don’t think he’ll be winning either. GGMY has been very successful, but not ‘Country Song of the Year’ successful. “Threaten Me With Heaven”, Vince Gill – I actually think he poses the biggest threat to Taylor because he’s the biggest Grammy darling in the category out of all of the other nominees. Plus, it’s a very classic, yet at the same time, very contemporary Country, which could bode well with the voters. “You and Tequila”, Kenny Chesney feat. Grace Potter – Goodness, would I LOVE for this to win. However, with this seeming like Kenny’s weakest single from the “Hemingway’s Whiskey” era in terms of performance on the charts, I don’t think he’ll be able to manage to persuade the voters. With that, Taylor’s the likely winner. I’ll throw in my two cents for the sake of it. Adele will almost positively sweep, I don’t see too many other nominations that will put up a fight. I would personally love to see Bon Iver win BNA. Jason Aldean, “Dirt Road Anthem”- I don’t understand his appeal to be honest. He seems like a good guy, but if this was to win a grammy, i would have serious issues with it. People want to say more pop oriented music is causing a downfall of country music, but songs like this contribute just as much in my opinion. Martina McBride, “I’m Gonna Love You Through It”- Happy Martina’s recognized, but this song was in no way big enough to win this. Pretty song for sure, just won’t pull out a grammy. Blake Shelton, “Honey Bee”- To be honest, I’ve been quite disappointed with Blake’s music lately. It was commercialy successful, but I don’t know, I just don’t really like this song and don’t thing it’ll win. Taylor Swift, “Mean”- I don’t understand the appeal of this song. I think it is one of her worst yet. I really want to see her really mature and grow up in her music. I just haven’t seen much of a progression. But she is commercially successful and obviously very popular, so she may pull this out. Carrie Underwood, “Mama’s Song”- I agree with Lawrence and believe this song will probably take the win. This was a weak year for songs for sure, but I still think it’s a testament that Underwood’s arguably worst song yet is still good enough to be nominated for a grammy. I also agree this is not a great song, it could’ve been a lot better, but I do believe it is the best vocal this year. I wonder if she can win while she has been silent for so long. It’s going to come down between her and Taylor I think, and between these two songs, “Mama’s Song” is the more worthy. For Song, all I can say is that I would love to see Vince Gill win that one. If not, I think “You and Tequila” has been one of Chesney’s best songs in awhile, since it finally sounds different than every single song by a guy lately. I don’t think “Mama’s Song” is one of Carrie’s best written songs either, but I do think she lifted it to a higher level with her fantastic vocal delivery. It definitely shouldn’t be considered Best Country Song material, but I would not begrudge it a win for Best Female Country Vocal Performance. Is anyone else as surprised as I am that “Remind Me” was snubbed so blatantly? Why are there only 4 nominees in the Country Duo/Group/Collaboration Vocal Performance? Makes no sense how they dwindled that category down to four out of nowhere, and RM wasn’t nominated in it. I’m kind of shocked that Brad Paisley didn’t get a nomination at all, in GENERAL! Well, it looks like Arista only has to do 100% block-voting on the only nomination they have, which is for Carrie’s “Mama’s Song”. Personally, with Arista not having to split votes with any other artists and fully support Carrie, I think she has the best shot at winning Solo Country Vocal now. I’d love to see her beat Taylor, too. It’d be a nice revenge shot after Carrie’s impeccable “Just A Dream” lost to Taylor’s sloppy, bland, and boring “White Horse”. @Priscila: Both “Remind Me” and “Old Alabama” were submitted. I think this probably caused a split vote, which ultimately left both RM and OA out of the running, because neither had enough individual votes to pull in front of the other. It’s a shame, because “Remind Me” cannot be submitted again, but this song deserves Grammy recognition, IMO. And Carrie and Brad are both Grammy darlings as well; if this had been any other year and Arista had only submitted one of Brad’s duets, it stands to reason RM would’ve stood a great chance at winning something. @Tara: I’m genuinely curious to know why you think “Mean” should win over “Mama’s Song”? Personally, I think mean is a terribly immature song with an even worse vocal. MS is not a great (or even average) song from a songwriting standpoint, but the vocal performance alone elevates it above “Mean” by a long shot. I understand the song was popular and became an anthem of sorts for the bullied, but between the immaturity of the lyrics and the cringeworthy vocal, Taylor shouldn’t even stand a chance, IMO. Carrie is also a Grammy darling; the fact that she was even nominated for anything (let alone a single as weak as MS) shows how much they adore Carrie. I give her a huge edge over Taylor here. Karly, I think “Mama’s Song” is beautiful and sweet, but poorly constructed. The lyrics have always felt a little lazy to me. “Mean” is just a more interesting song, musically and lyricaly. I think the arrangement is terrific. I don’t find the song immature –in fact, I think it’s a good mix of perspectives–, but I do find the bridge immature. It undermines the premise of the song: Someone commenting on her vocal skills, critic or not, is not “mean.” For that reason, I don’t think the song is really award worthy, but against its competition in this instance, it’s probably the best. I agree CU is (or has been) a Grammy darling, but I sometimes wish she weren’t. Rewarding “Last Name” and “Mama’s Song” is not going to encourage her to take her material to the next level. I do firmly believe “Just a Dream” should have won, though. Pretty dreary cast of nominees across the board in all genres. Spalding’s win was awesome, but in a race against some of Amy Winehouse’s and Vince Gill’s best work, the Hancock win was a lazy career achievement award. I think Taylor Swift (Mean), Adele, and Nikki Minaj deserve to win their categories. I think Mean should win best vocal performance and probably song too. As for “Cost of Living.” Even if it was submitted, it really doesn’t deserve to be on the list, much less win. The song bombed on the charts in a major way. It didn’t win favor with country listeners and/or radio programers. So unless it has major artistic merit (and it doesn’t really; its topical but kinda boring) I don’t think it deserves recognition. Ronnie Dunn needs to release more radio-friendly music, like Brooks & Dunn did, or his career should end. I think “Honey Bee” “You and Tequila” and “Mean” are far more deserving. “Cost of Living” resonated pretty well with a lot of folks facing hard times where I live. Ronnie’s vocal was heartfelt, and the lyrics certainly struck a chord with me. Guess it’s not as meaningful and “radio-friendly” as “Honeybee.” As for “Mean” and “Tequila,” I found one sort of condescending, the other sort of boring. Different strokes…. Sweetcheeks. “Cost of Living” resonated with a lot cuz of its topic but the song died at 19 on the charts. Thats makes the song a radio failure in my book, at least for an established artist. I think its great if a lot of people connected with the song due to its theme but I don’t think a song that bombed radio-wise is grammy material, except in the rarest situations. Sweetcheeks out. Where a song peaks on the charts is only one criteria when judging its overall impact and artistry, and determing whether it might be award-worthy. Since when does the arbitrary world of “country radio” (whatever that is these days) have the last word? “Cost of Living” is not a classic, but it is a strong, moving song, and until you pointed out it “died” at 19 on some song chart, I didn’t even care. In fact, I still don’t. “Independence Day” “died” at #12. “Sin Wagon” “died” at #52. Bon Iver’s “Holocene” – up for all-field Song and Record this year – didn’t chart on U.S. radio at all that I know of. Random assortment of examples off the top of my head. If awards only recognized that which was already ubiquitous, they’d be very redundant. If anything, that’s the danger the Grammys are in right now – the Album/Single/Song fields this year feel only a step or two removed from the total fluff of AMAs or People’s Choice Awards. And “Sin Wagon” was not a radio hit but the Dixie Chicks were a huge commercial force around 2000. Some of their albums went Diamond. They were “ubiquitous:” Nominating the Dixie Chicks surely wasn’t going to be a move that would hurt ratings or cause casual viewers to lose interest. The grammys are trying to attract a mass viewing audience. With that in mind, I think they should limit the number of songs they nominate that failed to attract a mass radio audience. Some noncommercial songs are fine, of course, but they ought to be exceptionally meritorious. I just don’t see “Cost of living” as belonging. I’m glad some people like it however. If its resonating with some Ronnie Dunn can be proud of his work. I don’t think Nicki Minaj will win the Best New Artist award. If the past is any indication, it will go to either The Band Perry or Bon Iver. I originally thought it would be The Band Perry’s award to lose, but the more I think about it, I’m beginning to realize that Bon Iver may take it since he’s the only artist of the five BNA Artists to be nominated in the Song of the Year and Record of the Year categories, as well, which could be a good example of Grammy love. This year will be interesting. I’m thinking that it’s between The Band Perry and Bon Iver.